Hinduism with its plethora of gods is endlessly complex and therefore endlessly misunderstood. But the message that it carries in all its various symbols and rituals is only one — liberation for the individual and attainment of the Supreme. The human mind is conditioned to handle forms alone — “nama and rupa” — name and form. Anything abstract is anathema to the mind and therefore the rishis gave us countless forms on which to concentrate in order to go the nameless and formless. One can never penetrate their camouflage without understanding the inner message. The forms of the deities are only pointers to help the aspiring seekers to arrive at the ultimate goal. The sage Vyasa wrote the eighteen Puranas which dealt with the stories of the various gods. Of this, The Skanda Purana which depicts the life of Skanda or Kartikeya, is the longest and contains eighty-one thousand couplets. 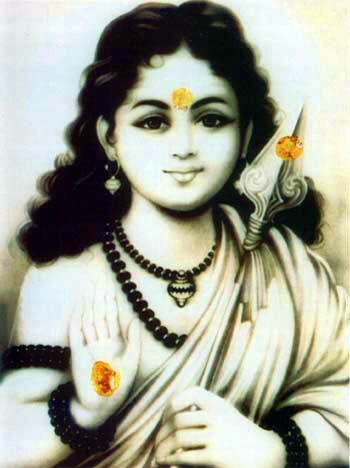 In South India he is known as Muruga and Subramania. Shiva is considered as an ascetic yet he is the father of three of the most popular gods in the Hindu pantheon. Shiva along with Shakti constitute the positive and negative forces which make up this universe. From Shiva comes all energy. He is the nuclear energy underlying the subatomic particles. At the very core of matter, Shiva whirls in his cosmic dance as Nataraja. Modern physics has shown that the rhythm of creation and destruction goes on in every subatomic particle as they appear to do an energy dance of these opposite processes of creation and destruction. Shiva and his sons are all aspects of the great electromagnetic field that controls life on this planet. The etymology of Kartikeya’s birth is very interesting. Before creation the supreme light of the Brahman filled the akasha, which is the only element which existed at that time. From that it passed on to become, vayu (air), agni(fire), apas (water) and prithvi (earth). These are the five great elements, known as the pancha maha bhutas, which make up our cosmos as well as our own bodies. This transformation from the subtle to the gross is depicted in the birth of Kartikeya. When the earth was threatened by the great demon known as Taraka, the gods went and begged Vishnu to do something about it. He told them that the only one who could kill the demon was the son of Shiva. Shiva was an ascetic who lived in the high ranges of the Himalayas. It was most unlikely that he would ever marry, much less beget a son. Eventually by using various dubious methods the gods persuaded Shiva to marry Parvati, the daughter of the Himalayas. Shiva’s seed which had been kept for years was ejected into the akasha or etheric space. It was transported through the air by the wind god Vayu, who found it too hot to hold and handed it over to Agni, the god of Fire. The potent seed was too hot even for the god of Fire so he dropped it into the waters of the river Ganga. It was deposited by the Ganga in a clump of reeds growing out of the earth. Thus the five great elements of ether, air, fire, water and earth combined to nurture the potent seed of Shiva, the one meant to destroy evil. It turned into a lovely boy. Thus Kartikeya’s birth is actually the story of creation. He was born of the union of Purusha and Prakriti, the Supreme Person and Nature. All creation takes place due to this union of Shiva and Shakti — the Supreme Person and Nature. The life of the gods as depicted in the Puranas demonstrate how the laws of nature that operate in the physical world can be utilised by us on our inward path which ends in the discovery of the divinity within us when the seeker realises that there is neither a path nor a goal. The journey is from “here to here”. The two great forces in Nature are gravity and electromagnetism. Kartikeya is the force of electromagnetism. This power is contained in his spear and expands throughout the world in light waves. Thus the forms of the gods all have an esoteric meaning which is not easily visible to the human eye. However it is true that the gods themselves will reveal themselves to the sincere seeker. Kartikeya is noted for being a most compassionate God and will surely bless all those who resort to him. 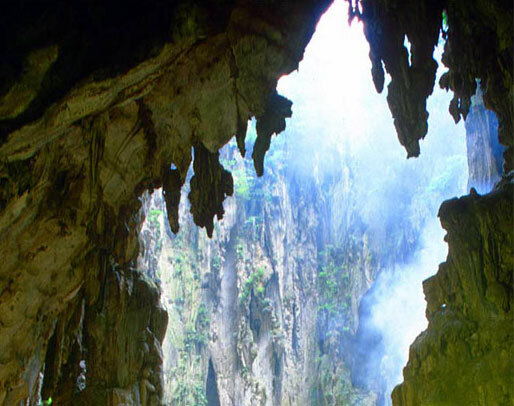 The States of Selangor and Perak in Malaysia have a number of limestone caves. 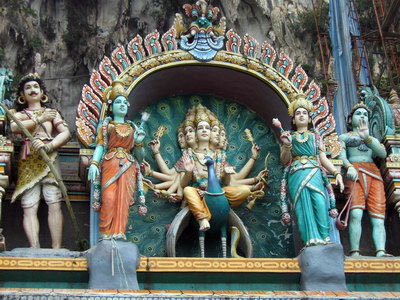 The Batu caves are about fifteen kilometers away from Kuala Lumpur In the biggest of the caves is housed a shrine of Muruga or Karthikeya, the war god and the eldest son of Shiva. 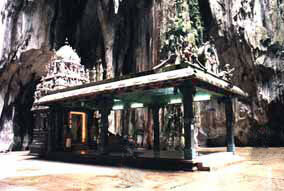 The Sanskrit word for cave, is "guha" and one of the names of Lord Muruga is also Guha since he likes to inhabit caves. As you approach the foot of the cave you can see a towering statue of Lord Muruga which dominates the scene from a kilometer away. There are many small shrines at the foot but what interested me most was the story told to me by Dr. Naga, who is scholar of Saivism. He said that a great yogi called Mouni Swami had meditated in that cave in the last century and it was entirely due to his tapas shakti (power of austerity) that Lord Muruga had manifested himself in that cave. His samdhi was at the foot of the cave but unfortunately the authorities knew very little about such matters and the samadhi shrine was inside a sort of gods own overrun by bats and mice. The door was locked but by the Swami's blessings we were able to get the key and venture inside. To my horror I saw a rat scuttle off as we approached. The first room was piled with all sorts of rubbish and I had to gingerly pick my way through. At the corner stood the samadhi marked by a small slab of concrete. But what interested me most was the fact that a rough sort of Shiva lingam was growing above the slab in a most peculiar fashion. I learned afterwards that is was "swayambhu" or growing by itself. In the gloaming as I stared fascinated at the stone I could definitely make out the features of a man. It was a strong face with a mop of hair and a beard. I could even see the benign eyes watching me. I was overwhelmed with a sense of joy and thanked the Swami for allowing me this wonderful opportunity of having his darshan. I was reminded of the samadhi of Bogar Nath swami in the hill shrine of Palni in Tamil Nadu. After this I went up the 300 steps leading to the cave temple. It was an enormous cave with stalactites and stalagmites growing all over the place. Water was still dripping from the roof. In one niche in the wall was a lovely figure of Lord Muruga in his form as Bala Muruga or the child Muruga. Further up in another niche was his figure as the General of the army of the Gods in full regalia. It was a fascinating shrine and my heart was bursting with gratitude to the divinity who had led me there. Now for the story of the cave. It is said that during the British occupation at the beginning of the 20thcentury, one of the rubber plantation owners had taken up some of the Indian workers to collect bat's droppings from the cave to be used in the rubber plantation. Apparently they found a spear stuck into the ground just at the spot where the idol of Muruga is kept now. 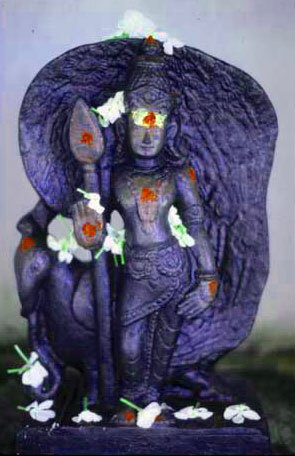 Of course to the Indian, the spear is a insignia of Lord Muruga and as soon as they saw it they started worshiping it. All the workers would come and bring flowers and incense and worship the Spear. Of course the Englishman had no idea of what it all meant. All he knew that the Indians were a superstitious lot and he had no time to waste with their nonsense. So he cracked his whip and told them to get on with their work and not waste half their day in worshiping this fetish. Since they did not listen to him, he went forward and plucked the spear from the ground and threw it into a heap of dirt in the corner. The Indians were shocked at this barbarous act on the part of the Englishman and warned him of the dire consequences which were sure to follow. Of course the intelligent westerner laughed in scorn at their ignorance. However it is said that very soon he fell ill of no known disease and very soon his condition began to deteriorate. No doctor could discover what he was suffering from. 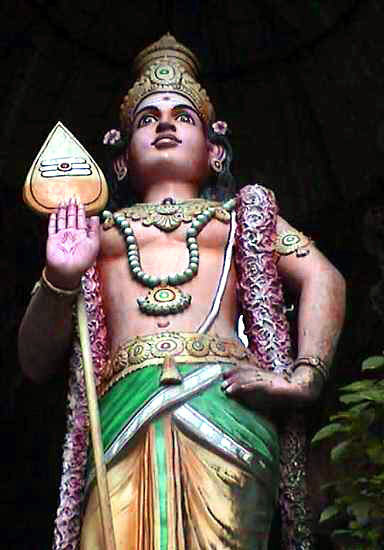 At that time when his mind was in a weak and humble state it is said that he had a vision of Lord Muruga who told him that he would get well if he reinstated the spear and gave permission to his workers to worship it. His miseries had made him a wiser man so he promptly hunted out the spear and kept it back in its place and the Tamil workers were allowed to continue with their worship. Since then the temple has grown and prospered and today countless pilgrims as well as tourists of other nationalities come to the shrine. Some come to worship and some as a tourist attraction. To the devout, the atmosphere is charged with the power of Muruga, the son of Shiva and many miracles are supposed to have taken place there. Of course the veil or spear manifested itself in that place only due to powerful presence of the Mouni Swami who had mediated on Lord Muruga for many years at that very spot.